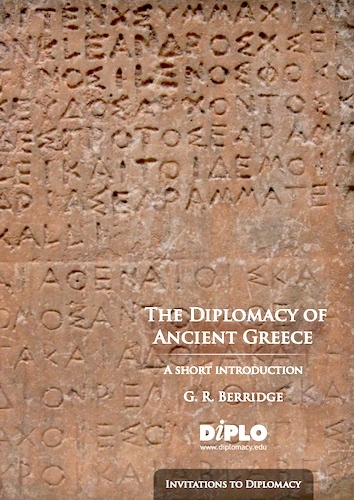 Formerly a university teacher, I am now a freelance writer specialising in the theory and practice of diplomacy from the earliest times until the present. 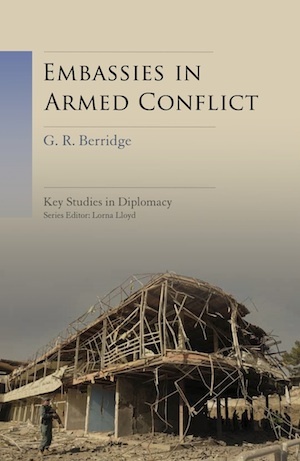 As well as hoping to encourage the study of diplomacy, this site provides periodic updating of my textbook (see immediately below). This page contains some news and views. The contents of the rest of the site can be navigated via the column on the left-hand side. Read more about this book on the publisher’s website. 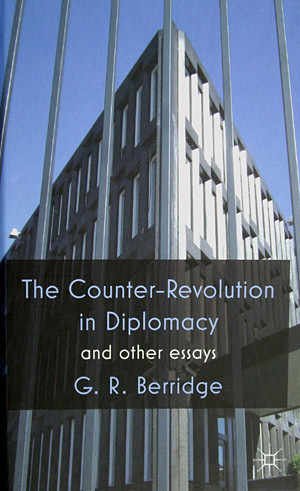 From the back cover: ‘Probably the most prolific contemporary writer on diplomacy is Professor Geoff R. Berridge … Each of his many books is impeccably written and full of insights into the fascinating formation of modern diplomacy” (Robert William Dry, New York University, USA, and Chairman of AFSA’s Committee on the Foreign Service Profession and Ethics); “I discovered Geoff Berridge’s book on diplomacy after serving as a diplomat for over 30 years. 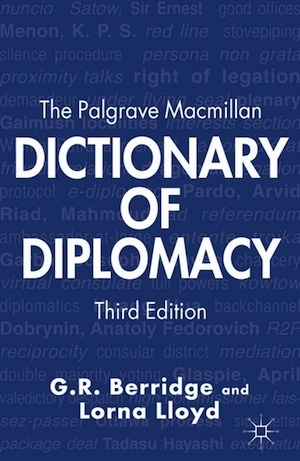 It is well-researched, sophisticated, inspiring and, where the subject invites it, suitably ironic” (Dr Max Schweizer, Head of Foreign Affairs and Applied Diplomacy, ZHAW School of Management and Law, Switzerland); “Berridge’s Diplomacy is an enlightening journey that takes the student, the practitioner and the general reader from the forefront to the backstage of current diplomatic practice. 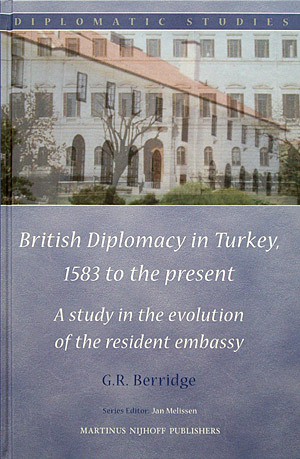 The thoroughly updated text – also enriched with a stimulating new treatment of embassies – is an invaluable guide to the stratagems and outcomes, continuities and innovations, of a centuries’ long process” (Arianna Arisi Rota, Professor of History of Diplomacy, University of Pavia, Italy). The front cover shows the building used as its headquarters by the British Secret Intelligence Service (SIS) since 1994. Inspired in design by Art Deco, Mayan and Aztec architecture, it is sometimes described mockingly as ‘Legoland’ but more commonly referred to as ‘Vauxhall Cross’. This is because of its location adjacent to the major crossroads of this name in the Vauxhall district of south-west London; it is also close to Vauxhall Bridge over the River Thames. The building has served as a backdrop for a number of James Bond films. Photograph (cropped slightly for design purposes) by Jim Bowen, 22 November 2007, licensed under the Creative Commons Attribution-Share Alike 2.0 Generic. It has long been suspected that Vladimir Putin’s government, in part via the agency of the Russian Embassy in London, gave covert support to the campaign that secured the narrow victory for the Brexiters in the June 2016 referendum in the UK. This was clearly in its interests because it was always apparent that such a triumph would not only politically distract and economically weaken one of its most resolute Western opponents but also stir up trouble on Ireland’s frontier with the United Kingdom and encourage separatism in Scotland, where pro-EU sentiment is strong. But Mrs May’s Conservative Party government and its powerful supporters in the news media, which are stubbornly determined to drag Britain out of the EU in the face of concerted opposition from both business and trade union organizations, have refused even to notice – let alone investigate – the evidence strongly suggesting Russian interference. And the reason is obvious: confirming this would seriously weaken the legitimacy of the referendum result. A few eloquent voices have raised the alarm on the Opposition benches in Parliament, and the very worthy House of Commons Select Committee on Digital, Culture, Media and Sport (DCMS) has added its support in its Final Report on Disinformation and ‘fake news’ (para. 273). In consequence, the National Crime Agency has accepted an investigative referral to it from the Electoral Commission. But this agency is over-stretched and its remit limited. Britain needs its equivalent of the Mueller inquiry into Trump’s ‘collusion’ with Russia during the US presidential election campaign that overlapped with the Brexit campaign in 2016. This is why, having just stumbled on it, I have signed a petition urging this, which can be found on the UK Government and Parliament ‘Petitions’ website here. It is already not far short of 10,000 signatures, at which point the government is obliged to respond to it; at 100,000 signatures it is required to consider it for a debate in parliament. The petition, which was created by Neil Rosser, is open until 11 August 2019 and can be signed by any British citizen or UK resident. Please sign now and encourage others to do likewise! Essential viewing from Chanel 4 News, 5 March 2019: The Banks Files: How Brexit ‘bad boy’ Arron Banks was eyeing a massive Russian gold deal. Pathetic Government Response: This petition passed the 10,000 signatures watershed some weeks ago (as at 4 April 2019 it has 14,097) and the Cabinet Office, on behalf of the British government, predictably rejected it. 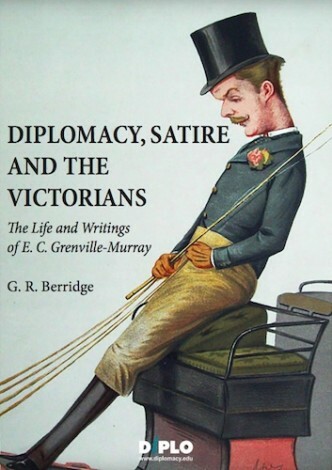 The defence of its position is pathetic: disjointed, repetitive, and stuffed with red herrings – all typical symptoms of the nervous breakdown brought on Whitehall by the Brexit fiasco and the semi-lunatic bunker mentality now exhibited by 10 Downing Street. Three arguments are offered. First, in line with what it said in its response to the DCMS Committee’s Interim Report in July 2018, it says that the government ‘has not seen evidence of successful interference in UK democratic processes’, repeating this mantra in the next line. But how can you see if you don’t look? In any case, why should interference only be of concern if it is successful? Should we refuse to investigate a house break-in because the burglar failed to find anything worth stealing? What is unsuccessful today might be successful tomorrow; the more so if it is not exposed and lessons are not learned. 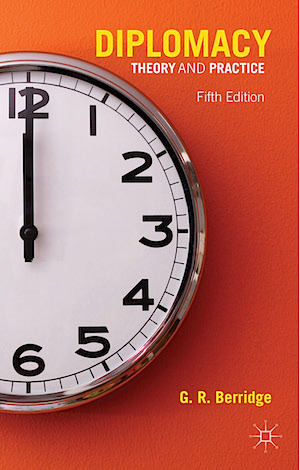 In 2018 the DCMS Committee took quite sufficient evidence of ‘a co-ordinated, long-standing campaign by the Russian Government to influence UK elections and referenda’ (p. 43) to warrant a full public inquiry. Second, the Cabinet Office response rehearses the steps taken by government ‘to ensure that there is a coordinated structure across all relevant UK authorities to defend against hostile foreign interference in British politics from any state’, as urged by the DCMS committee in its Interim Report (p. 52). But – while in principle a useful step – this obviously post-dated the 2016 referendum campaign and is in consequence little more than another attempt to throw dust in the public’s eyes. Third, its response having silently glided into admitting that interference as such is unacceptable (whether successful or not), and after trailing yet another red herring about the Security Services being too ‘independent’ to be tasked by ministers, the Cabinet Office claims that an independent inquiry into the 2016 referendum campaign is unnecessary because independent Russia-connected investigations, courtesy of the Electoral Commission and the National Crime Agency, are already underway. But as the DCMS Committee has pointed out, while these bodies are doing valuable work, they can only investigate individuals. The response of the Cabinet Office to this petition has done nothing to remove the suspicion that the May government will not countenance a public inquiry into Russia’s role in the 2016 referendum because of its fear that it would bring into question the legitimacy of the result, not to mention its continuous preoccupation with its lamentable consequences. ‘As former diplomats who have served around the world we have a clear understanding of what contributes to Britain’s influence in the world. Our advice to Theresa May today is clear: we should not leave the EU when we have no clarity about our final destination. Instead we must use the mechanism at our disposal, above all we must seek to extend the article 50 negotiating period. Our country’s national interest must always be paramount. The Brexit fiasco has already weakened the UK’s standing in the world. We strongly advocate a change of direction before it is too late. It is clear that Brexit has turned into a national crisis. There is no possible deal that will be a sensible alternative to the privileged one we have today as members of the EU with a seat at the table, inside the single market and customs union but outside the Euro[zone] and Schengen [area]. There is now, in addition to extending article 50, a powerful argument to go back to the people and ask them whether they want the negotiated Brexit deal or would prefer to stay in the European Union. Q. Which London embassy needs 13 cultural attachés? Answer: The Royal Embassy of Saudi Arabia. Why? Read on. The employment of the Saudi consulate-general and consul-general’s residence in Istanbul in the horrifying murder of the journalist Jamal Khashoggi in early October is now notorious. This has been followed by the revelation in a Channel 4 News report on 3 December (‘Saudi activist: “One tweet is enough to ruin your life”’) that the Saudi Embassy in Washington has been routinely intimidating Saudi students studying in the United States who voice criticisms of their government; for example, by severing grants, refusing to renew passports, and urging them to return home to an unknown fate. In these circumstances, the size, profile and declared aims of other Saudi missions warrant a closer look. A case in point is the Mayfair-based Saudi Embassy in London. This embassy is enormous. According to the latest London Diplomatic List, it has the third largest diplomatic staff of any embassy in the British capital. With 99 diplomatic officers, it is exceeded only by China (116) and the United States (181). In fourth position, some way behind, is the German Embassy (77), which is followed by France (68), Japan and Brazil (each with 61), Canada (60) and Russia (50). There is another striking feature of the Saudi Embassy: it has no less than 13 cultural attachés. This puts it, in this regard, virtually in a class of its own. Its nearest rival is France, with nine cultural attachés, followed by China with six and Italy with three. As for the other London embassies, most either have no cultural attaché at all, just one, or one officer who wears this hat along with another such as press officer. What do all of these Saudi cultural attachés do? Helpfully, the section of which they are members, the ‘Diplomatic Office of the Cultural Bureau’ (aka the ‘Saudi Arabian Cultural Bureau’ or SACB), which has separate offices in Cheswick High Road, answers this question in some detail on its own website. From this it is abundantly clear that its ‘core functions’ are exclusively concerned with university-level educational relationships, and most are unexceptionable. However, in so far as this involves Saudi students studying at British universities, of which there were over 8,000 at the last count, it is also apparent that the SACB holds them in an iron grip. Its website makes no bones about this (pun intended). It’s one thing to require reports at the end of every semester on the progress of these students at British universities, and to ‘urge’ them to participate in cultural activities that ‘do not conflict with Islamic faith and Saudi traditions’; but, in the circumstances, the further and last listed of the Bureau’s ‘core functions’ should ring an alarm bell. For this is stated to be the ‘supervision and monitoring of the activities of Saudi students and their clubs [emphasis added].’ No wonder Saudi Arabia’s cultural attachés represent, on a rough estimate, almost a quarter of all diplomatic officers of this class in the British capital. Like many others, I heaved a sigh of relief when I learned that Matthew Hedges, the Durham University PhD student who was disgracefully imprisoned for six months in Abu Dhabi and then sentenced to life imprisonment on a trumped up charge of spying for the British Secret Intelligence Service (SIS), had been pardoned and allowed to return home. But I had already begun to wonder how on earth he could have been arrested and thrown into prison on such a charge in the first place. All right, his research topic was in a politically sensitive area; however, many scholars conduct investigations of this sort in authoritarian regimes and are left undisturbed; some are even assisted in the hope that they might return home with a more favourable view of their hosts. I speak from personal experience of research in apartheid South Africa, also, as it happens, as a Durham University PhD student in the same department as Matthew Hedges. What is even more surprising about his treatment in the Emirates, however, is that he was accused of working for SIS. This accusation is surprising for two reasons. First, because as pointed out by Martin Chuvlov, Middle East Correspondent of The Guardian and winner of the Orwell prize for journalism in 2015, the UK has been one of the closest allies of the UAE for a long time, not least in ‘security and intelligence matters.’ (According to the London Diplomatic List, as at 7 November 2018, more than half of the UAE’s 33-strong embassy to the UK consists of military and ‘police’ attachés.) Will Tricks, since 2014 one of the closest aides of the Emirati ruler, Crown Prince Mohammed bin Zayhed (‘MbZ’), is a former SIS station chief in Abu Dhabi. So why was the case ever allowed to become such a major diplomatic incident? 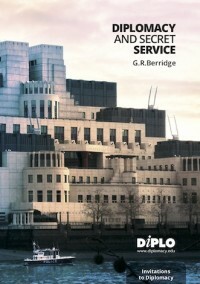 Second, in his outstanding book, Intelligence Power in Peace and War, published in 1996, Michael Herman, a former senior production manager at GCHQ, revealed that there was ‘a tacit professional recognition that [intelligence] cooperation is not necessarily a bar to continued targeting of each other’s government, defence forces and the like’ (p. 211). 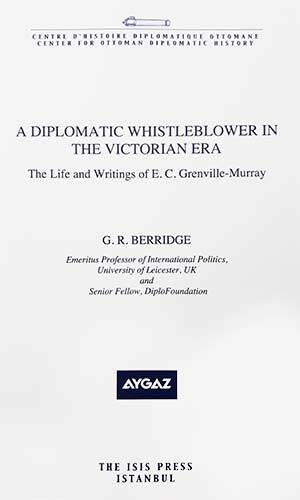 Therefore, even were Hedges to have been an agent run by an SIS officer in the British Embassy in Abu Dhabi, the professional sin was hardly a great one and, from a friend, should have incurred no more than a rap on the knuckles. The explanation for the brutal treatment of Matthew Hedges – apart from the natural reflexes of an authoritarian regime that pays no more than lip service to academic freedom – probably has two parts. First, a desire on the part of the UAE to show that it won’t be pushed around; the shock announcement of the life sentence came shortly after pressure was being mounted on the UAE-Saudi axis to halt air strikes in Yemen. Second, a weakening of the UK-UAE relationship on Theresa May’s watch, partly because personal ties count for the Emirati, reports Chuvlov, and MbZ doesn’t get on with May in the way that he did with David Cameron, and – more worryingly – partly because Britain, paralysed by Brexit and probably doomed to leave the EU next March, is already seen by the UAE, as well as others, as an increasingly irrelevant player in international affairs. (Compare the risible conclusion of James Rogers, calculated via a quantitative analysis of 35 ‘indicators’, that the UK is ‘the world’s second most capable country’ after the United States.) Britain will soon cease to be ‘a leading member of the EU’ and also be economically weaker, developments that will also call into question its continuing entitlement to a permanent seat on the UN Security Council. As the permanent under-secretary at the Foreign Office, Sir Simon MacDonald, said on ‘Inside the Foreign Office’, the very good recently broadcast BBC2 television series, Brexit means that Britain will have ‘to work harder’ to get its way in the future, which also means working harder – and with fewer resources – to bring home citizens in distress abroad. (Ponder that, Brexit supporters.) The UAE is also the sort of regime to which Britain will have to bend the knee even further in order to secure post-Brexit transition period trade deals. In this connection, it’s interesting that on the same TV programme just mentioned, Britain’s ambassador to Brazil reported that Brazilians were quite pleased with Brexit because Britain would be so desperate for trade deals that they would be bound to get good terms from London. So much for Boris Johnson’s post-Brexit ‘sunlit uplands’ for ‘Global Britain’. Predictably enough, the hard right-wing nationalists in Parliament – led by the Member for the Eighteenth Century, Jacob-Rees Mogg and the Member for the Second World War, Boris Johnson, in alliance with the Member for the Battle of the Boyne, Arlene Foster – are pounding their chests and claiming that Theresa May’s government could have got a much better deal on Brexit. As a result, they are demanding either that she go back to Brussels and do better, or leave the field to them. What they either don’t understand (like James Rogers of the Henry Jackson Society) or choose to overlook is that, as I was taught many years ago, ‘power is as power does’; in other words, that power is a relative concept – it is only revealed when its potential is put to the test in particular relationships, in the case of Brexit a negotiation lasting for 17 months between Britain and the EU. And what these have revealed is that a united EU is far more powerful than a divided UK. I conclude, therefore, that in reality it is highly unlikely that the Brextremists could have done any better, and would also be unable to do any better in the future. And let’s not forget that their own men were actually in charge of the specially created Department for Exiting the EU (DExEU) through the whole negotiation. I hasten to add that the point I am making here should in no way be interpreted as support for Mrs May’s deal. I find myself thinking along the same lines as Jonathan Freedland.